Download free Kontakt sounds ? Want to download free Kontakt sounds ? You're at the right place ! Today I make a small post about free Kontakt sounds. Why ? Because I am a big fan of Kontakt. In my (humble) opinion it is far the best sampler you can find for a professional use in music production. It's been a long time since I started to collect free Kontakt sounds. Today, I submit you my list in case of need. The sample libraries listed hereafter are suitable for Kontakt 2,3 & 4. I haven't tested them with all versions but they should work normally. If you don't own Kontakt yourself, you can donwload Digidesign Structure Free for use in ProTools and you'll be able to open the following Kontakt drum samples & Kontakt libraries. I don't know much more about other sampler instruments, for I almost only use everyday these two, but you should be able to do the same with Halion3 and Mach5. However, you'll see Kontakt or Kontakt Player are very easy to use & intuitive, so even if you don't know much about sampling, just a little knowledge about MIDI & software instruments is enough to begin to have fun & to know if you want to spend a few hundred bucks to seriously work with it or not. 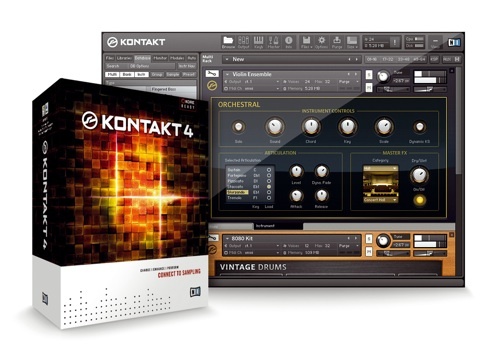 I think Kontakt definitely worth it, because it is robust (I mean it's not buggy & believe me, I extensively use it), it is very usable & expandable (look where you are, you can find free Kontakt sounds all over the internet) and best of all it is loaded with a huge 43 GB samples library that covers almost every instruments or standard needs in music creation (from orchestra instruments to crappy synth leads via acoustic guitar etc...). Big Mono is free Kontakt library and consists in a retro analogue drumkit recorded in mint conditions. A lot of sample packs for Kontakt from many producers in various styles. Angel Toy Glockenspiel, Blue Mountains Wind Chimes, Egyptian Zil, Tibetan Tingsha. Bavarian Zither, BoomWhackers Percussion Tubes, DIY Music Box, Granular Gardening, Granular Slate Rocks, Medieval Psaltery, Soprano and Baritone African Marimbas, Suspended Slate Rocks, Tibetan Singing Bowls, Toy and African Marimbas, Toy Piano. Some free stuff to download on this facebook page. DSK Music has released DSK Top Keys vol. 1, a free collection of high quality multisample instruments, featuring 9 acoustic pianos, 9 electric pianos & 9 organs. Oboe, Honky Tonk Piano, Steinway Grand Piano, Bouzouki... very nice work from 2 italian fellows. Grab it now ! This collection includes : 6 classic keyboards (Clavinet, Dyno Rhodes, DX7 Rhodes, Hohner Pianet, Fender Rhodes and Wurlitzer) + 3 saxophones (tenor, soprano and alto) + 3 guitars (acoustic, nylon and steel) + Steinway piano in three variations: standard, bright and damped. Bass station, Speak & Spell, Vox Humana, Polymoog Strings, Aah, Aeropad, Aquarium, Nebulous, SQ Strings, Buddhist. New Kontakt Instruments Every Week ! No Name Toy Keyboard, LoFi Kalimba, Smallest electronic keyboard, Chromatic Hits, Sidekick Electronic Drum. Yamaha kit, Jazz Guitar, Vinyl Hammond, Garage Vinyl Full Kit, Classic - Nylon Guitar…Various bass, drums & organ. Free Jazz Funk Drum Sample Library + utilities for Kontakt. Electronic instruments, synth lead, electronic drumkit & loops. Cretone TT, Koestler Rigoletto, Red Grand, ToysToysToys. Electric Piano MkI & MkII. TryPack (500 MB), 30 instruments, a taste of their 3 main libraries AIR, Elements and Synergy. Speak & Spell, VA Brush Kit, Music Boxes. Mike's iMoog - Moog Voyager. Enjoy & have fun ! Go from free Kontakt sounds to Music Production ? Go from free Kontakt sounds to Free Soundfont ? Go back to Home ?